After Farage’s remarks yesterday that the UKIP would repeal all the anti-discrimination laws, this just about pretty much sums it all up. Though it misses out all the other appalling stuff attacking women, the working class and employees generally. They will doubtless hotly deny all of it with the refrain that they are a non-racist, non-sectarian party, and besides, it’s not in their manifesto. To the first statement, the reply is ‘pull the other one’, and two the second, as they’re not going to release their manifesto until much later, this one’ll have to do. It’s what Farage meant, whatever he claims to the contrary. The negative campaign that puts UKIP at the top of most left leaning blogs actually GENERATES votes by their core voter that is the wealthy grey vote. The posters that left leaning blogs need to promote are actually how any of the poor, in or out of work, able bodied or disabled, of all ages can survive. All the pundits predict the most severe hung parliament, with neither Tory nor Labour gaining sufficient to form a majority government and rule. Even with Scotland’s SNP, a few Plaid Cymru of Wales and eve fewer Greens, Labour has insufficient to stop the below happening after Thursday 7 May. The Tories are planning to stay in power for next 5 years as a caretaker government, even if individual Tories lose their seats. The only way to stop that nightmare scenario is to put pencil cross against new logos that are anti austiery, welfare reform and state pension abolition that is coming with the Universal Credit and Flat Rate State Pension, that is anything but a single tier from 2016. WHY THESE PARTIES COULD WIN BIG IF ONLY THE POOR KNEW THEY EXISTED? The poor have never had as much power as they have on Thursday 7 May. The claimant count, the working poor on tax credits, the disabled / chronic sick claimants and the poor pensioners, outnumber in such marginals, all other voters. 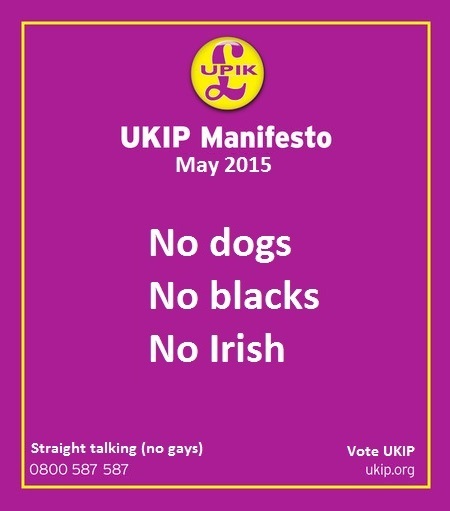 That manifesto is what gets them votes. They stole the BNP vote, have the support of Britain First and EDL and the Tories who think Cameron is a leftie! The reassurances that they are not racist, sexist etc assuage the conscience of the secret racists. The obviously racist comments from councillors and other supporters are what gain them support. Whatever Farage says UKIP is simply the National Front trying to look respectable..